The Amobi Okoye Foundation is turning 10! Posted on May 25, 2017 by Jennifer N. Simpson	in autoimmune encephalitis, Entertainment News, H-Town, JNoS PR, Non-Profit Organization and tagged 10 year Anniversary, Amobi Okoye, AO Foundation. 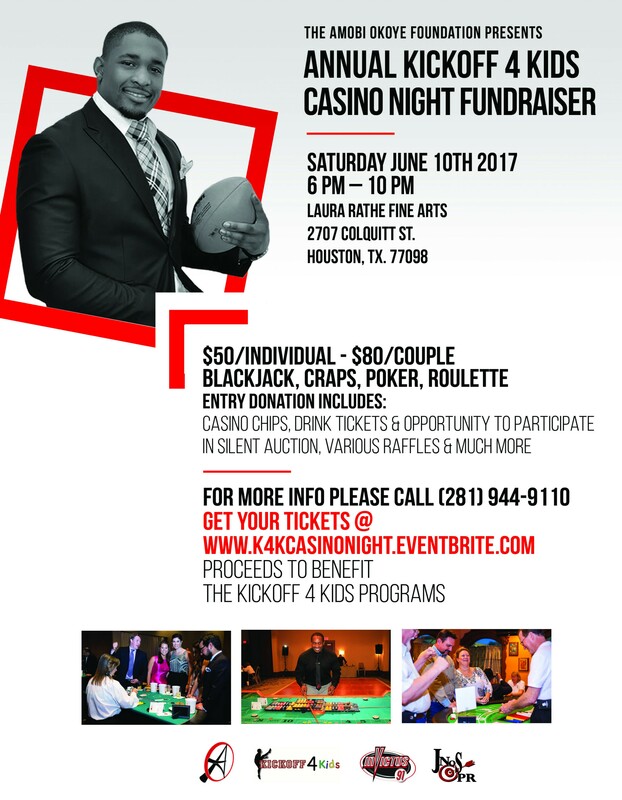 The Amobi Okoye Foundation will be hosting its Annual Kickoff 4 Kids Casino Night Fundraiser on June 10th 2017. This weekend will commemorate the foundation’s​ 10 year anniversary and will collectively celebrate Amobi Okoye’s 30th birthday, a well-deserved tribute for the Autoimmune Encephalitis Survivor. This exciting event will be held at Laura Rathe Fine Art & offers something for everyone. It will be an evening of entertainment, cocktails, hearty appetizers, gaming tables, celebrity guests & dealers, silent auctions & raffles that will be fun for all guests.